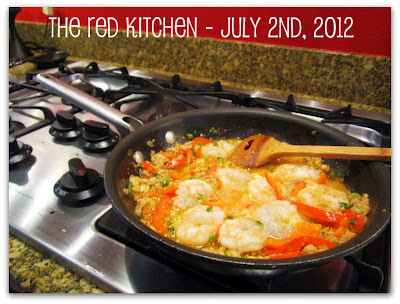 Lately I've been lamenting the upcoming loss of my red kitchen. You see, the house is on the market. We're relocating soon to the Memphis area for my husband's job, and we're hoping to get moved in time for the girls to start school. Last weekend, as I cooked in a friend's home in Germantown, I really started to miss my own kitchen. I picked out every little thing in this custom - built home, and the details that I most specifically chose from the heart were in the kitchen. I was much more particular about how I wanted things in that room. More than in any other room. I hope the buyers are deserving of my loss! Anyway, I learned from a girl in my Communications department at UALR that when she used canned crab meat, she also added the liquid from the can for the extra flavor. That was many years ago, but I've always been thankful for her tip! Heat a large saute pan over medium high heat. Add the butter and olive oil. When the butter has melted, swirl the pan to evenly coat the bottom. 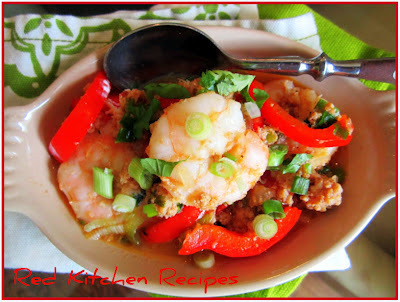 Add the bell pepper, then the green onions, then the cajun seasoning. Cook until the bell pepper is soft, then add the canned crab meat with its juices. When the ingredients are gently simmering, add the shrimp. Lightly toss the shrimp until it is done. This will take about 5 minutes. Top with garnish, and serve alone or on top of rice or pasta. Add more cajun seasoning if needed.